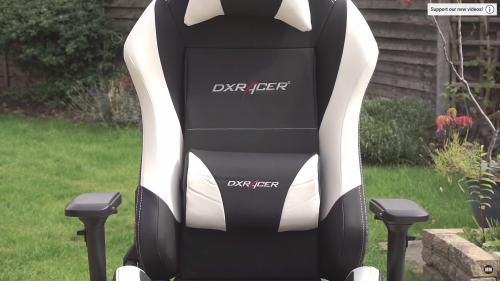 DXRacer have for a long time been established as the Gaming Chair company to beat. From famous Youtubers to everyday gamers, their presence has been felt and is synonymous with quality products. Does the IRON Gaming Chair live up to the prestigious name? When we first received the chair, we had a jolly old time getting it put together, made easy as all the tools needed are included, while the rest is just push in fittings. Simply and elegant, we had it together within 10 minutes. I wish more items were this easily assembled. Plus when it’s together it’s sturdy and feels very secure. The chair base is made out of aluminium, has a maximum weight of 900kg which unless you have a pet elephant that loves stealing your chair is WAY more than anyone would ever need. The overall rated weight limit for the chair as a whole is 181kg which gives room for those of those with the slightly larger waistlines. 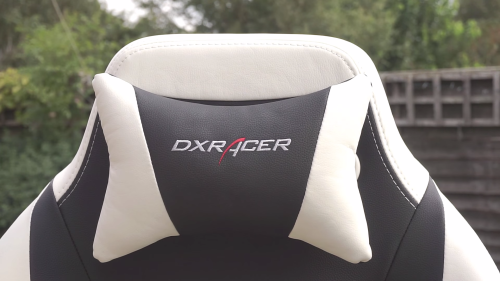 DXRacer has opted for a PU textured material which gives it a beautiful leather look with a supple soft feel. The craftsmanship is immediately apparent, clean lines, beautiful embroidery and stitching. As with some of their other chairs, the back is nicely padded and allows for a strap to be passed around the padding to give you that additional lumbar support with the pillow. The Lumbar Support pillow is SO nice to have. 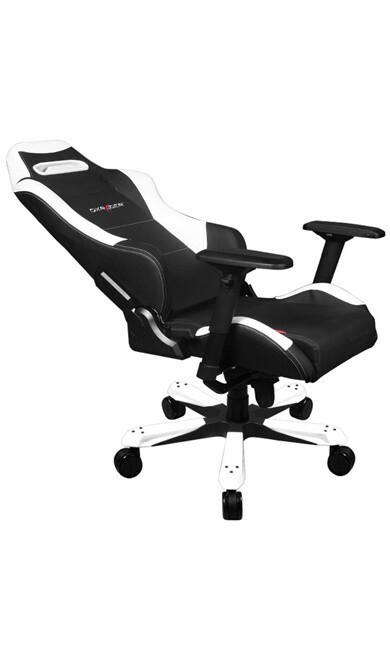 It offers you that extra push into your lower-mid back that makes you sit up straighter, which makes those longer gaming / work sessions infinitely more comfortable. 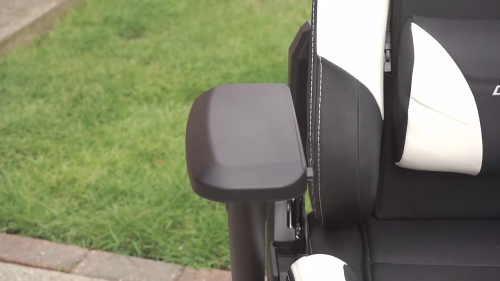 You can move it up and down the backrest to your needs fairly easily with one hand. 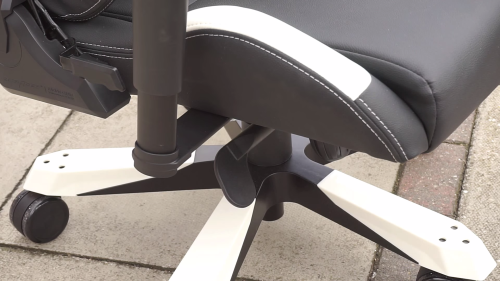 It’s nicely designed, with the same PU material as the other parts of the chair, gives you a little bit of softer padding along with the stiffer kind that does the actual back adjustment. Since having it I have done a few longer sessions of working in the office, and the lumbar support is a spine saver, that little bit of help sitting straight really does make a world of difference. The same rules apply to the headrest cushion, nicely styled, ‘squishier’ than the Lumbar Support, but rigid enough that it helps hold your head in place. My previous chairs have never had a headrest pillow, and it’s not something I particularly thought I wanted. However once I tried it on the DXRacer IRON Gaming Chair, I have to say, it is a wonderful addition, the space without it feels empty and uncomfortable. The headrest cushion fits onto the section with a butterfly clip that just slips through the gap that is there and allows you to adjust it to your needs. Onto the arm rests which are another feature that can ascertain the comfort level of a chair. The rest area itself is barely padded, opting for the more rigid plastic feel. This enables you to find your comfort zone for resting your elbows while using your computer or whatever you may be doing while sitting in the chair. I have personally set mine slightly forward, kept them centrally aligned but twisted my right arm towards the base, as I find this the most comfortable while using my computer mouse for an extended period of time. One issue I have had is that due to the various positions you can place the armrests at, they feel slightly looser than I would like them to. With the base and back being so sturdy and rock steady, the arms sort of ‘wobble’ with the slightest pressure, making them feel like the weak link in the chair. Not that I feel like they would randomly break off, but when comparing it to the metal base and other hinges, the plastic feel of the armrests is clear. Under the seat itself you have 2 levers, the left one handles your ability to move the entire top of the seat into a slightly reclined / inclined angle. This unlocks with a pull up and then can be locked by pushing it down again. 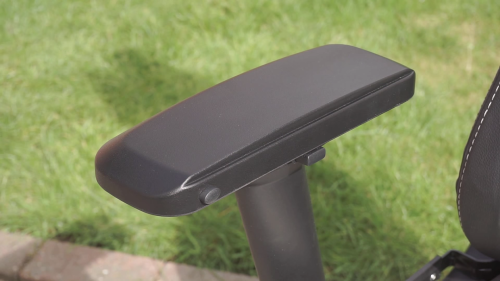 The right lever handles your hydraulic lift height of the chair, as you would expect on any office / gaming chair. I keep the seat at it’s base level as this is perfect for my computing needs and sits just snug under my desk, but it’s nice to have that lifting room if needed. My left lever has been used quite a few times since I got this chair, it’s been a bit tough to find my perfect angle, but I think I finally have it nailed. On the right side just before your armrest you also have a little grip lever than handles being able to recline the back of the chair only. 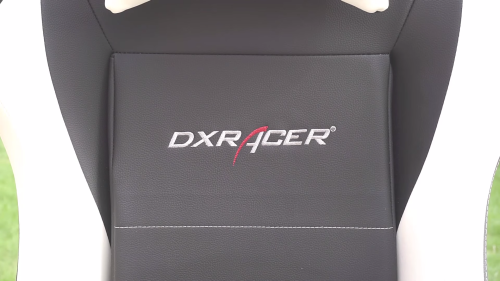 DXRacer really have made it possible to customize the chair to your personal needs, moving not only the arms, full seat, but also just the backrest. It can recline to almost a flat 180 degrees, nice to stretch out your limbs in between sessions or fall asleep if you are slightly more daring! Never seen a chair previously that can recline so elegantly as the IRON Gaming Chair, and take the weight of someone lying on it without feeling like it’s going to topple over. This is rock steady. The chair is a design masterpiece, it looks stunning with the flashy white accents against the semi-matte black, even the base has white covers you can put on them to pull the entire design together. My only complaints out of the whole experience are that the arms feel slightly weaker than the rest of the chair, and that the material on the chair can sometimes give you a slightly sweaty behind (but I think that’s mainly any leather material!). 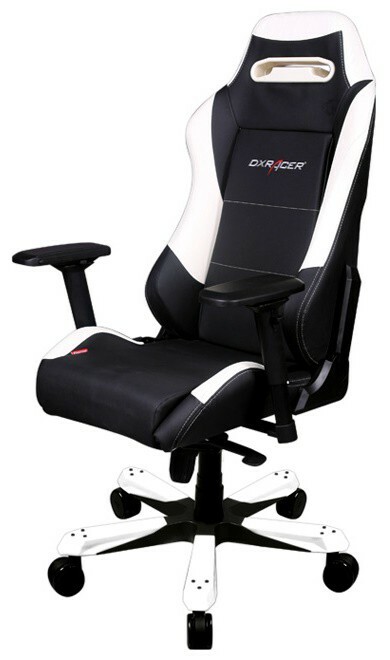 Overall I cannot fault the chair too much, it is BEAUTIFUL, has a plethora of features, super comfortable even during long sessions of sitting and has the brilliant name of DXRacer behind it.